Simon: Having taken steps to reduce our electricity consumption a little, to combat rising electricity prices, I was also keen to try and generate some renewable power ourselves. It was clear the cost of a professional system would be prohibitive. However, on trawling the web, I stumbled across some US sites discussing self-build panels and how to make them. This looked like an interesting challenge. In late 2009, however, I soon realized the planned Feed In Tariff (FIT) would make a professional system a good investment and so in January 2010, after begging, stealing and borrowing money, I had a professional 2.2kW PV system installed on the south facing roof of my house. That system is now paying nicely, having generated 2000 kWh in the first year. 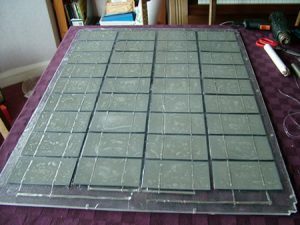 However, I was still fascinated by the DIY idea and had started making modest panels from cells bought on ebay. 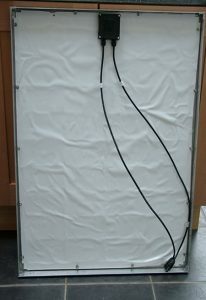 Having made several mistakes, I have now evolved this interest to the point of working towards a 600 W grid tie system to go alongside the professional system (but electrically quite separate). 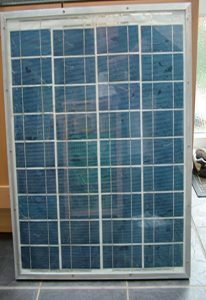 The aim is to install this on a ground floor extension roof and connect it to the grid via a Steca 500 grid-tie inverter from Mysolarshop.co.uk. This is an outline of how the panels are made. However, I emphasise that I’m no expert and the panels I make are not professional or perfect, though they work perfectly well. 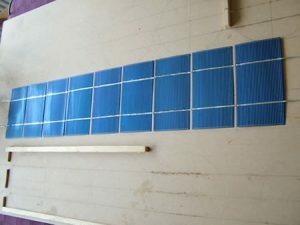 Solar Cells: The panels are all made using 7.5cm x 15cm (3×6 inch) multi-crystalline solar cells purchased via ebay, from the US. I paid over £1/watt for mine but they can now be purchased for substantially less than £1 per watt from many auction sites and direct sellers, including UK sellers. You can use whatever solar cells you want but 3×6 or 6×6 inch cells are best for higher power panels. Each solar cell has an open circuit voltage of about 0.5V but the current depends on the size of the cell. 3×6 inch cells can generate about 3.5A in full sun. 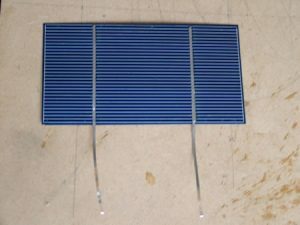 Tabbing: The first step is to tab the solar cells. This involves soldering flat, thin tab wire to each cell. Again tab and bus wire can be purchased from various sellers. 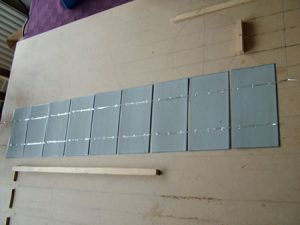 A typical panel has 36 cells so you need 72 x 15 cm wires. The soldering process is easy after a bit of practice but beware the solar cells are very thin and fragile so care must be taken. You need a good flat surface to put the solar cell on and I find it best to use a bevelled soldering tip. Note that before making solar panels, I’d never done any soldering so anyone can do it. I run a thin layer of lead-free silver bearing solder along the bus rails of each cell (the 2 mm wide white stripes on the blue side of the cell) and then solder the tab wire on top. After practice, I can do 36 cells in about 1 hour. A tabbed cell is shown in Figure 1. Turn each cell over and apply solder to the 6 white squares on the back. My panels have 4 strings of 9 cells. To get good straight strings, I use a board with 2 wooden strips acting as a guide. A cell is placed face (blue side) down between the strips and it’s wires from the front (blue) side are then soldered to the 6 squares on the back of another cell. This process is repeated for 9 solar cells, shuffling the growing string up the board between the wooden strips (figures 2, 3 and 4). I use small wooden spacer strips (about 5 mm spacing) to get a uniform spacing between cells. When the 9 cells are done, two extra tab wires are attached to the back of the end (first) cell which has no wires on it. 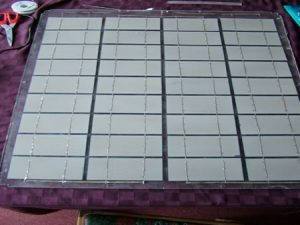 Professional panels use special low-iron, toughened glass for the panel window but I use 4 mm or 5 mm thick clear perspex sheet (again, cheap, 2nd-hand sheets from private sellers on ebay). Holes are drilled around the edge for fixing to the aluminium frame. To achieve a good waterproof seal for the cells, I use EVA thermoplastic encapsulant (purchased via eBay from the US or China at about £1 /sq foot). You need two pieces the same size as the perspex window. One piece is placed on the perspex sheet and I then I use a paint stripping heat gun and a metal roller to heat it onto the perspex. The EVA goes clear when heated and sticks to the perspex. As this is not professionally laminated, there are often small air bubbles trapped in it – I use the roller to squeeze some out but it’s not perfect – small bubbles are not critical. This process can take 30 mins per panel. Mounting the solar cells and connecting strings: Next, 4 strings of solar cells are laid on the first EVA layer, with the blue side down on the EVA (figure 5). I use a 5 mm gap between the strings. They must be arranged in opposite directions, such that if the top solar cell in a string has the end wires coming from the back, the same cell in the adjacent string should have the wires coming from the front. Remember each cell is essentially a battery with a + and – contact and cells and strings must join + to -. I arrange the left most string, as seen from the back, with the -ve end at the intended top end of the panel window (to match the junction boxes I use), the top edge of this cell being about 5 cm from the top edge of the perspex window. When arranged neatly in parallel lines, bus wire (wider flat wire) is soldered across the top and bottom tab wires of the strings to make the + to – joins. The top solar cells of the central 2 cell strings are joined by bus wire and the bottom cells of the outer pairs of strings are similarly joined. Then two separate bus wires are run from the top cells of the outermost cell strings towards the middle – these will form the final output contacts for the panel. This arrangement provides a 36 cell series string. The free ends of these latter two wires should be bent up vertically with a space between them to match the contacts in the junction box. If the junction box you plan to use has a pair of bypass diodes, you can solder a small length (2-3 cm) of bus wire to the middle of the bus bar that joins the middle two cell strings, and bend it upwards. Figures 5 and 6 and the schematic in Figure 7 show the bus wire connections. To make a weather-proof seal, the 2nd layer of EVA is melted onto the solar cell layer. I use a self-made narrow roller to press the heated 2nd EVA sheet onto the EVA layer below, in the gaps between the solar cells and around the edges of the panel. The EVA is very sticky when hot so rolling needs to be done a few seconds after the heat gun has been used. It’s easiest to play the heat gun over a smallish section of the panel and then run the roller carefully between the solar cells. Practice is needed here to get the heating and rolling right – the EVA can easily melt into a mess if overheated. Try to ensure the 2nd EVA layer adheres to the backs of the cells with as few air bubbles as possible. It’s very hard to achieve this as the EVA naturally tends to bubble up and buckle when heated – this is a major downside of using EVA without a laminator. The 2nd EVA layer has been applied in figure 6. The upturned ends of the two output bus wires are the output terminal wires – they (and the extra bus connector if added, as mentioned earlier) should be pushed through pre-cut slots in the EVA and the EVA melted around them. To form the back of the panel (to protect the cells) one can either make a shallow perspex tray which can be bolted to the back of the cell sheet when finalising the panel or one can use Tedlar sheet. If using a perspex tray, cut another perspex sheet the same size as the front window and glue/epoxy 4 narrow (1 cm wide) perspex strips around the edge – it must be water-tight. I have now started using tedlar sheet instead as it circumvents the problems of the perspex tray bulging due to trapped hot air when the panel is in use. It also better allows the cells to stay cool and makes a lighter panel. 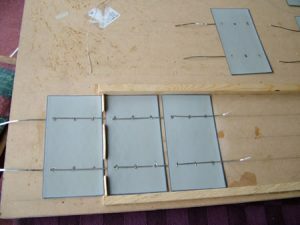 If you used a perspex tray, holes will need to be drilled to match the bolt holes around the edge of the perspex front window and also where the output terminal bus wires come through – the junction box will be fixed to the perspex tray over these bus-wire holes. If using tedlar sheet, e.g. also from ebay (ask EVA sellers if they have any), this is then heated onto the back of the 2nd EVA sheet though I don’t roll this or only very gently if the cells are not perfectly flat on the window – I find the cells often have a slight curvature due to soldering effects and so cells can easily break. If cell curvature is slight, before putting the 2nd EVA layer on, you can heat the cells onto the first EVA layer – they should stick to the front EVA sheet and be flat. Before heating the tedlar on, slots need to be pre-cut in it for the upright bus wires that will connect to the junction box. Using tedlar is new to me and I got a rather poor finish in figure 8 where It’s quite badly buckled in places. It may be easier in future to heat the 2nd EVA layer again and gradually lower the tedlar down on to it. Junction box: Once the tedlar is on, the junction box can be fitted on to the back of the tedlar (using epoxy and/or good quality silicone sealant). 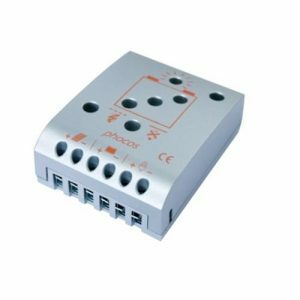 I bought pre-fitted junction boxes from the US which come with MC4 connectors already attached. The +ve and -ve bus wires from the panel then need to be soldered to the relevant terminals in the junction box. If the junction box has a pair of bypass diodes, the extra upright bus connection from the bus wire connecting the central pair of cell strings needs to be soldered to the central connector between the diodes. If you use a simple plastic box, you’ll need to connect the bus wires to a terminal block glued inside the box and then attach output cables to the +ve and -ve terminals of the block, which then pass out through holes in the lower side of the box. 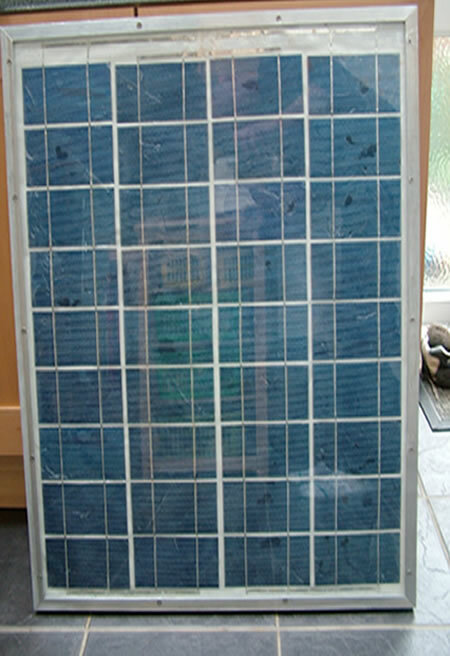 Solar frame: Finally, I make an aluminium frame for the panel using aluminium angle (4 cm x 2 cm, 3 mm thick) from a scrap dealer. The size is 68 cm x 86 cm so the window just fits inside. I screw these together via angle sections on the inside at the corners. The whole window can now be bolted into the aluminium frame. Run a bead of silicone sealant around the edge of the frame so the window clamps down onto it. The corners of the window may need to be cut/shaped (before doing the first EVA layer) to fit the internal frame corners. The panel is finished (figures 9 and 10). 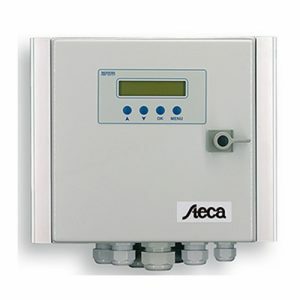 The above mentioned cells yield a panel with a Voc of about 20V, a current of 3.5A and a peak power of around 60Wp. 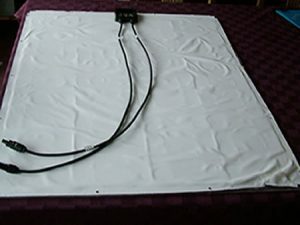 I plan to use 8 such panels in series and connect to a DC isolator switch, then to a Steca 500 grid-tie inverter and then through an AC isolator switch and generation meter, to the household supply. A properly qualified electrician must do the final connections and check the system. Remember two key thing where great care is needed.